Mark Crippen and Nicki Praiswater's bees make the mesquite honey they infuse with jalapeño and habanero. Once Mark Crippen and Nicki Praiswater began keeping bees as a hobby, they became obsessed, with both the industrious insects and the golden honey they produced. While conducting flavor experiments, the Bee Whisperer (Mark) and Honey Mixologist (Nicki) hit upon a fantastic combo: raw mesquite flower honey infused with fresh jalapeño and habanero peppers. Now they make it by hand in small batches, without using ultra-filtration or high heat. The smoky, sweet, and spicy result can be drizzled on just about everything. Add some to your everyday favorite foods, on bread, in glazes, and salad dressings—but don't drink it from the bottle. We know it's tempting, but you'll be too sad when it's gone so fast. Handmade in Houston, Texas. Nicki, the foodie, loves something else about them: “I appreciate that these tiny creatures provide such a treat for us to enjoy!" Soon after becoming passionate beekeepers, their honey inspired a wave of creative ambition. They began infusing it, testing ingredients on friends and family. Eventually they decided their favorites were too good not to share—lucky us. I bought this as a gift and had a chance to sample the honey after they opened the bottle. Not only did the person I buy it for love it, but I loved it and plan on buying myself a bottle. 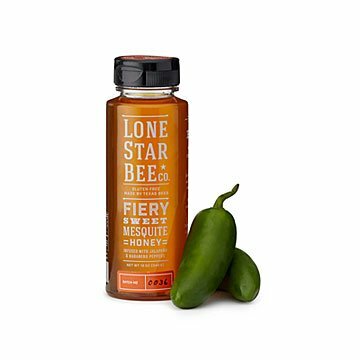 The honey is smooth and has a delicious flavor that would be perfect in any BBQ glaze or in a wing sauce. It is spicy and the burn is a slow build and slow fade. This is not a honey for people who do not enjoy spicy foods. For myself. I used to buy a local hot honey back in Jersey but the farm that produced it went belly up. I've been hot honey-less since. Until now! Love this product! Interesting and delicious twist to honey.